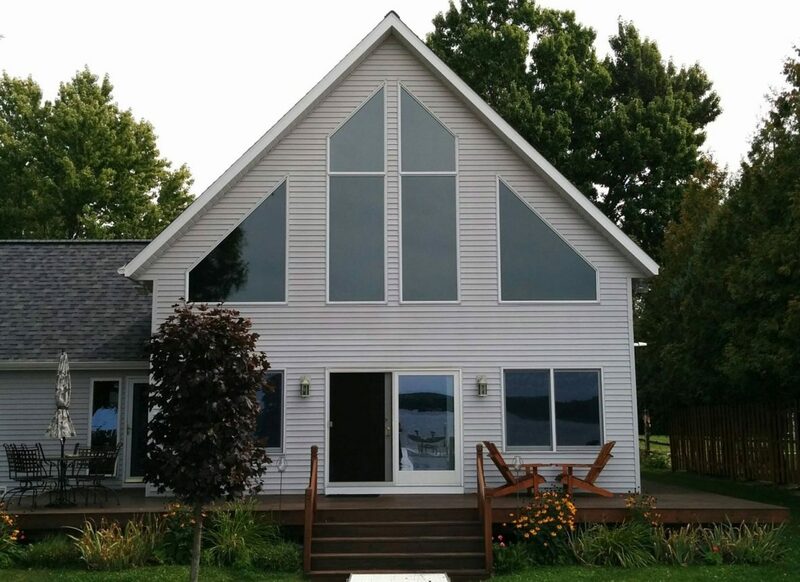 Bellaire Window Tinting – This cozy little lake home had very unique mounts and trophies inside that called for extra protection. Western sun was cooking the interior of the home in the afternoon and evening causing premature fading of the interiors. Vista V18 Dual Reflective was a perfect solution to reduce significant portions of the afternoon light intensity, heat and 99.9% UV rays. The patio was also only 3-4 steps away from the water, so the photos had to be taken from the homeowners dock. If you are interested in learning more about how window film can add sun protection to your home, click HERE, give us a call today at 231.943.9773 or Contact Us using our online form submission for an absolutely free, no obligation consultation and quotation on implementing home or business window film. Our service areas include Traverse City, Grand Rapids, Cadillac, Petoskey, Roscommon, Ludington Michigan and their surrounding areas.